Climate change has been identified by the steel industry around the world as a major environmental challenge for more than two and a half decades. Long before the findings of the Intergovernmental Panel on Climate Change (IPCC) in 2007, major steel producers recognized that long term solutions were needed to tackle the carbon dioxide (CO2) emissions produced during the production of steel. As a result, the steel industry has been highly proactive in improving energy consumption and reducing greenhouse gas (GHG) emissions. The greenhouse gas of most relevance to the world steel industry is carbon dioxide (CO2). As per World Steel Association (WSA), on average, 1.8 tons of CO2 gas are emitted for every ton of steel produced. According to the International Energy Agency (IEA), in 2010 the iron and steel industry accounted for approximately 6.7 % of total world CO2 emissions. CO2 emissions per ton of crude steel produced are now around 50 % lower which has resulted into a dramatic reduction in climate impact for the steel sector. The best steel plants now operate close to the thermodynamics limits set by present steel production technologies. This in turn means that steel producers are limited in how much further they can improve their energy efficiency. With most major energy savings already achieved, additional large reductions in CO2 emissions are not possible using present technologies. Decreasing of the GHG (greenhouse gas) emissions further have meant introduction of breakthrough technologies. The reduction of CO2 emissions to the level that post-Kyoto policies have required ‘out of box’ thinking since it has raised specific challenges. No simple processes have been available off-the-shelf for the accomplishment of this objective. Deep paradigm shifts in the way steel is produced has to be imagined and the corresponding breakthrough technologies are to be designed and developed. The kind of reductions being called for by governments and international bodies require the invention and implementation of radical new production technologies. This is the background to the creation of the ULCOS (Ultra-Low CO2 Steelmaking) programme, a cooperative European research and development initiative launched in 2004 as a consequence of the Kyoto protocol. ULCOS seeks ways to bring about further drastic reductions in CO2 emissions from steel production. The programme’s key objective is to search for breakthrough process routes that could, in the future, when fully developed, demonstrate the potential of large cuts in CO2 emissions for the production of steel from iron ore. The programme aims to reduce CO2 emissions compared to today’s production technologies by a minimum of 50 %. Achieving such an ambitious target requires the kind of paradigm shift in the steel production that will change the way steel plants presently operate around the world. ULCOS is part of a worldwide steel-industry programme designed to identify steelmaking technologies with the potential of substantial reduction of the CO2. Under this programme attempts are being made to find an answer of making steel in the most sustainable way. The members of ULCOS programme are a consortium of 48 European companies and organisations from 15 European countries, including all major European Union (EU) steel companies, energy and engineering partners, research institutes and universities. It is also supported by the European Commission. ULCOS is a European programme, yet it is the largest endeavour in the steel industry worldwide that is proactively seeking solutions to the threat of global warming. The consortium´s expertise ranges from steelmaking to biomass production and geological CO2 storage, and includes process engineering, the economics of energy, and foresight studies in climate change. Today, ULCOS is the largest initiative within the worldwide steel industry proactively looking for solutions to the threat of global warming. The ULCOS partners fund 60 % of the EUR 75 million budget. The European Commission contributes the remaining 40 % through its RTD (research and technological development) framework programmes and the RFCS (Research Fund Coal Steel) programmes. Both are set up to promote industrial research and technological development within Europe. The present steel production technology is based on coal which is based mostly on carbon, on natural gas which is a mix of carbon and hydrogen, and on scrap based electric arc furnaces. To identify CO2 -lean process routes, three major solution possible paths are (i) a shift away from coal, called decarbonising, whereby carbon would be replaced by hydrogen or electricity, in processes such as hydrogen reduction or electrolysis of iron ore, (ii) the introduction of CCS (carbon capture and storage) and mineral carbonation technologies, and (iii) the use of sustainable biomass. ULCOS is a large programme carefully set to face long term and complex challenges that the steel industry is facing, alongside society as a whole. 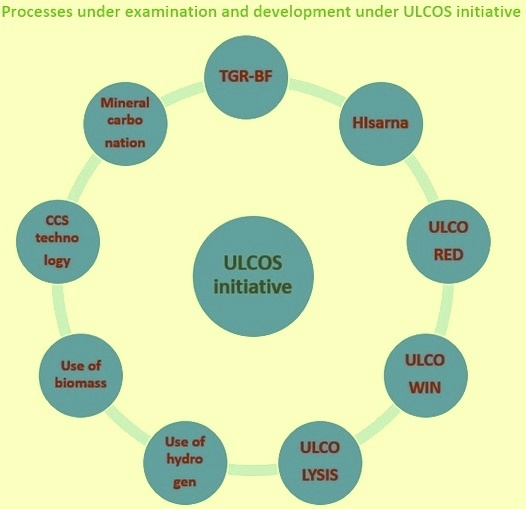 ULCOS programme has four steps namely (i) process concept-building, (ii) large-scale demonstration, (iii) large-scale experimentation of a first commercial plant. (iv) deployment of the technology in Europe and in the world. ULCOS which was a research initiative, has presently turned into a demonstration initiative. Considerable research has been carried out in the ULCOS programme since its start-up in 2004. An initial feasibility study lasting four to five years investigated over 80 technologies/concepts routes in the initial phase of its research programme, using modelling and laboratory approaches to evaluate their potential, in terms of CO2 emissions, energy consumption, operating cost of making steel and sustainability. Several concepts have been investigated in parallel. Among all of these, the following broad families of process routes have been selected within the ULCOS programme for further investigation and eventual scale up to a size where commercial implementation can take over. A variant of blast furnace (BF) where the top gas of the BF goes through CO2 capture and the remaining reducing gas is re-injected at the base of the reactor, which is moreover operated with pure oxygen rather than hot blast (air). This process has been called as the top gas recycling blast furnace (TGR-BF). The CO2 -rich gas stream is sent to storage (CCS technology). A smelting reduction process which is called HIsarna process. This process is based on the combination of a hot cyclone and of a bath smelter and incorporates some of the technology features of the HIsmelt process. The process also uses pure oxygen and generates off-gas which is almost ready for storage (CCS technology). A direct reduction (DR) process which is called ULCORED. This process produces DRI (direct reduced iron) in a shaft furnace, either from natural gas or gas from coal gasification. Off-gas from the shaft is recycled into the process after CO2 has been captured, which leaves the DR plant in a concentrated stream and goes to storage (CCS technology). Two electrolysis process variants called as ULCOWIN and ULCOLYSIS. ULCOWIN operates slightly above 100 deg C in a water alkaline solution populated by small grains of ore (electro-winning process). ULCOLYSIS operates at steelmaking temperature with a molten salt electrolyte made of a slag (pyro-electrolysis). There are two more options which are available. The first one consists in using hydrogen for direct reduction, when and if it is available without any carbon footprint. The second one is based on the use of sustainable biomass, the first embodiment of which is charcoal produced from eucalyptus sustainable plantations grown in tropical countries. The use of CCS and mineral carbonation within new ULCOS technologies have also been assessed. CCS has been identified from the start as a powerful solution. About mineral carbonation it has been identified that it can only result in moderate, although important, overall emissions reductions. ULCOS has now selected four process concepts – which have been experimentally tested – that could lead to a reduction of CO2 emissions by more than half compared to current best practices. These concepts are now being implemented in working steel plants in the second phase of the ULCOS project. The results of phase 2 of the ULCOS programme can potentially be rolled out into production plants some 15 to 20 years from now. The selected process concepts are (i) re-engineering of the blast furnace to incorporate CCS in the core of the process, (ii) smelting reduction with CCS capabilities, (iii) massive use of natural gas with more CO2-lean technologies than today, (iv) hydrogen steelmaking and electrolysis of iron ore. The TGR-BF appears the most promising solution in the shorter term, since the existing BFs can be retrofitted to the new technology. This can keep the extensive capital expenditures which are needed for switching over to the breakthrough technologies under some control. Further, the very principle of the process delivers energy savings because the capture of CO2 and the recycling of the purified gas displaces high temperature chemical equilibria (Boudouard reaction) and uses coke and coal with a higher efficiency inside the BF than is possible with conventional operation. This balances the extra costs incurred by the capture and storage, to some extent. The proper concept which is applied in the TGR-BF is that of in-process CO2 capture, with oxygen operation. The oxygen part is similar to oxy-fuel operation but is not identical. The recycling part is original and is the key reason why some energy savings and the corresponding cut in operating cost are gained. This concept has been tested on a large scale laboratory blast furnace in Luleå, Sweden with a positive outcome. Where there is the availability of the natural gas, ULCORED process route is an attractive option. The concept applied to the ULCORED process is similar to the concept of TGR-BF and it also includes the use of pure oxygen and in-process recycling of the shaft top-gas, in addition to other features like a series of shift reactors in the recycling loop. For the validation of this concept a one ton/hour pilot is planned to be erected in Luleå in the coming years by LKAB, an ULCOS partner. The HIsarna process being developed is going to become an available option in coming years probably for green field steel plants. The HIsarna process is slightly different from the TGR-BF and ULCORED processes as it does not involve a recycling loop for the gas. The smelter gas is oxidized at the cyclone level, where some reduction is carried out along with combustion to preheat and melt the ore. There is a counter current flow of the gas against the iron stream, in which its chemical energy is fully exhausted. An 8 tons/hour pilot plant has been erected and tested in the course of the ULCOS program. The pilot plant was started on April 2011. In the first campaign the plant was operated from 18th April to 11th June 2011. There were four starts up. The first start-up was not successful. The other three start-ups were successful. The injection rate achieved was 60 % of the capacity. Available data from the operation has shown that the process operated as expected but more operating hours are needed to confirm this. The number of operating hours was below expectation. The second campaign has started on 16th October 2012. It continued till end November 2012. The electrolysis processes have been developed from scratch within the ULCOS program and, therefore, are still operating at laboratory scale. Although they hold the promise of zero emissions, if they have access to green electricity, time is required to scale them up to a commercial size (10 to 20 years). ULCOWIN process consist of alkaline electrolysis of iron ore. Electrolysis is commonly used to produce metals other than steel and requires large amounts of electricity. The process would depend on a CO2-lean electricity source such as hydro or nuclear power. ULCOLYSIS is the molten oxide electrolysis. Molten oxide electrolysis works by passing an electric current through molten slag fed with iron oxide. The iron oxide breaks down into liquid iron and oxygen gas. No CO2 is produced. Process emissions are further reduced with a CO2-lean electricity source. In hydrogen steelmaking Iron is reduced from iron ore at high temperatures (above 1,300 deg C) and with very short reaction times. No CO2 is emitted but producing hydrogen requires large amounts of CO2-lean electricity. This process can also be operated on low CO2 fuels like natural gas. Hydrogen steelmaking depends heavily on the availability of green hydrogen, while the use of charcoal, far away from growing countries, would require the set-up of complex logistics, including heavy infrastructure across several continents. ULCOS is a long term initiative of the steel industry. It is full of promises but also of risks and traps, a situation which is probably similar to what other sectors are experiencing. Risks are related to the complexity of the issue, which calls on the development and the implementation of breakthrough technologies under time constraints which are very short. Patience, support, sincerity and continued determination are needed for this programme to become a successful initiative of the steel industry and achieve most of the targeted objectives.